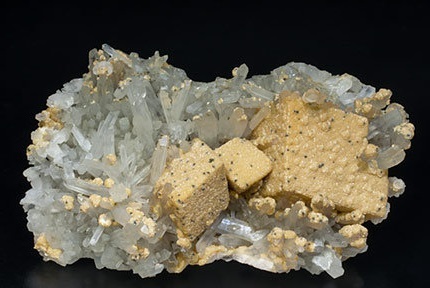 While the Monroeville locality is best known for its quartz and ferroan dolomite, it does occasionally yield good specimens of several other species including calcite. Calcite is one of Ohio’s more diverse minerals, due to the numerous crystal forms the mineral is known produce. Even within the borders of Ohio, the variety of calcite occurrences is limitless and new habits are still discovered by field collectors today. While the Monroeville site is certainly not one of Ohio’s premier calcite localities, true Ohio collectors would agree that while crystals from this locality are not as impressive, these crystals are equally important as specimens from the Custar Stone quarry in Wood County or the Sylvania quarry in Lucas County. Typically, calcite crystals range from 1 to 5 cm in size. However, calcite crystals up to 20 cm have been reported from septaria at this locality, though rarely complete at that size. These crystals vary in form, color and clarity but are often found attractively resting on slightly color-contrasting ferroan dolomite. Crystals can be white, tan, brown, gray or clear and are generally complex scalenohedrons or prisms, each with rhombohedral terminations, or rounded scalenohedrons. The majority of calcite crystals found at this locality have crude, etched or melted, and uneven faces. Throughout the state, the large septaria in the Huron shale are often chiefly comprised of limestone, bearing thick calcite veins with occasional ferroan dolomite. At the Monroeville locality, calcite is the less common vein mineral. In fact, many of the septaria at the Monroeville locality contain little or no calcite. Calcite, when present, generally forms small isolated crystals. Most of the calcite which has been observed at the locality formed after the 5th generation of ferroan dolomite but before the 6th generation of ferroan dolomite. This places the main calcite event after the last generation of quartz. Specimens of calcite over quartz are regularly found at the locality. In fact, the calcite in the photo to the left has a large impression in the back where a smoky quartz crystal had been attached. An earlier calcite event occurred after the 2nd generation of quartz. Most of the calcite from this first generation is light tan to brown colored and opaque and typically less attractive. This generation forms veins of small intergrown crystals. These veins of calcite are more friable than calcite from the 2nd generation. Rarely, these veins open into pockets with light tan scalenohedral crystal clusters. It should be noted that small isolated scalenohedral crystals also occur in the 2nd generation of calcite. Thus, the form alone does not indicate the generation. It is common to find calcite in combination with other minerals, especially quartz. The photo to the right displays a typical example of calcite with 3rd generation quartz on 5th generation ferroan dolomite. Note that the ferroan dolomite is grown over the quartz. Four distinct crystal forms have been observed on calcite crystals from the Monroeville locality. The most commonly observed calcite crystals are either scalenohedral with negative scalenohedral modifications and rhombohedral terminations as illustrated by crystal A in figure V to the right or prismatic with large rhombohedral terminations. Many of the prismatic crystals have negative rhombohedral modifications and scalenohedral modifications as illustrated by crystal B to the right. Occasionally, crystals will have 12 prism faces as seen in crystal C. These are dihexagonal prism faces and not 1st and 2nd order prisms. Specimens with 1st and 2nd order prism faces may occur, but have not been identified. Small flattened rhombohedrons, sometimes stacked as in the photo to the left, also occur in the 2nd generation. Another calcite form infrequently seen at this locality is the basic scalenohedron, illustrated as crystal D to the right. Scalenohedral crystals have rounded faces and are often indistinct. Scalenohedral crystals from the 1st generation are very unlike crystals from the 2nd generation both in crystal form and other physical properties. The largest and most aesthetic calcite crystals found at the Lamereaux road bridge locality are the more common complex crystals from the 2nd generation, as illustrated by crystals A, B and C in figure V. Crystal forms A and B appear more frequently than crystal C. These slightly translucent crystals vary from white to milky gray to chocolate brown in color and are occasionally zoned from white to brown as the crystal in the photo to the upper right. Crystals less than 1 cm in size are occasionally mostly clear. It is often difficult to discern the exact dominant form of these crystals due to their inherent globular shape and melted, indistinct faces. Crystals that are elongate are more easily identified, than shorter crystals. Generally, the only easily identifiable faces are the rhombohedral terminations. The photo to the upper left displays the common rhombohedral termination found on these crystals. This particular crystal also happens to be dominated by the dihexagonal prism. Many of these crystals appear formless in contrast to the sharper crystals of ferroan dolomite. The photo to the lower left displays a typical example of this effect. From a distance, it appears to be a rounded calcite mass. However, upon close inspection this crystal is scalenohedral with negative scalenohedral modifications and rhombohedral terminations. 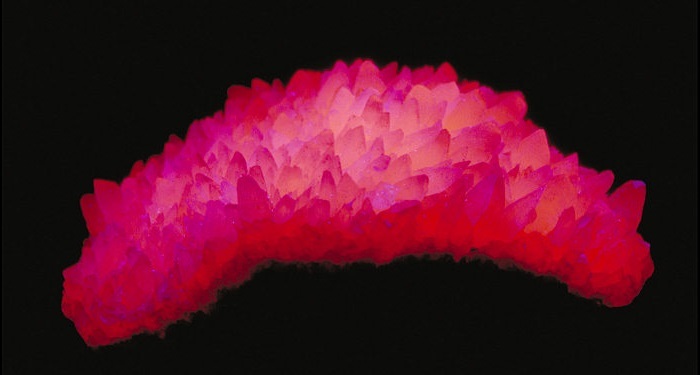 The clear, gray and white crystals of this form often show a distinct pale reddish pink fluorescence under short wave ultraviolet light and a stronger red fluorescence under mid wave ultraviolet light. An example under mid wave is displayed to the lower right. Some etched crystals also display a very pale blue white fluorescence.